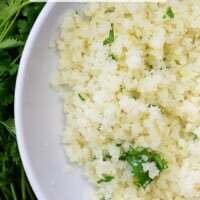 Cilantro lime cauliflower rice is just about the simplest little side dish to serve on taco night or as a base for your low carb burrito bowls! Is anyone else just completely and utterly in love with Mexican food? I’m going to go ahead and guess all of you are, because I can’t imagine a world in which people aren’t daydreaming about that goodness all day long. I’ve been a fan of the burrito joints for a long time. Chipotle was my first love, but then I discovered Qdoba. Y’all, I know this is controversial, but I think Qdoba is about 3,938 times better than Chipotle. I’m sorry, but it’s just the way it is. These days, I grab a taco salad with extra meat, some fajita veggies, cheese, guac, and sour cream. It’s delicious and it totally satisfies any cravings I might be having. I do love that cilantro lime rice though, so I thought I’d recreate it at home. 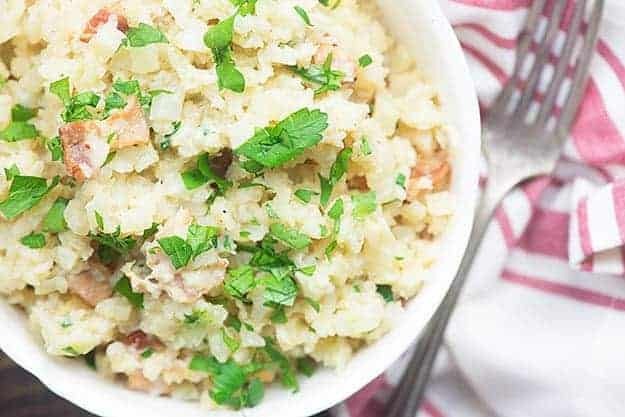 This cilantro lime rice recipe starts with cauliflower and I think you’re going to love it! You can either start with a whole head of fresh cauliflower or a bag of the fresh cauliflower florets. Frozen cauliflower isn’t a good option for cauliflower rice. If you’re starting with a head of cauliflower, chop it into florets and then add it to your food processor. 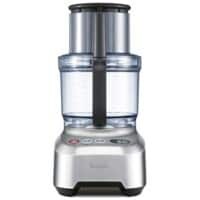 This is the food processor I use (affiliate link) and it’s one of my favorite tools in the kitchen. 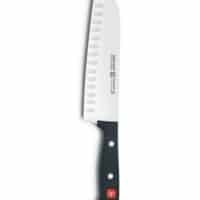 I use it for grating cheese and slicing veggies all day long. If you don’t have a food processor, get your knife out and start chopping. And chopping and chopping and chopping until you have tiny little rice like pieces. I’ve heard that you can also use a box grater to grate the cauliflower, but I haven’t tried this myself and can’t speak to how easy it is. Cauliflower rice can be cooked in a skillet on the stove, roasted in the oven, steamed in a stove top steamer or microwaved. Each method produces rice that tastes just a bit different and they’re all pretty good. My favorite two methods are roasting the rice in the oven and cooking on the stove in a skillet. I think you get a lot more flavor with these two methods. 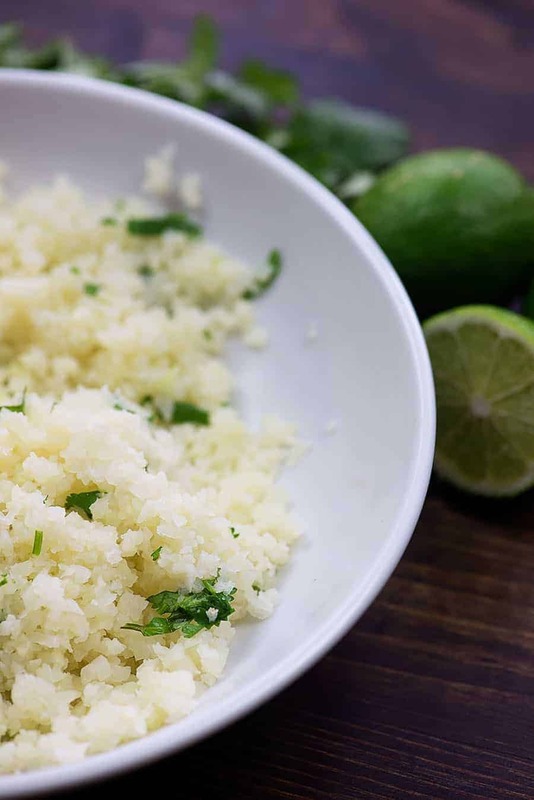 For this cilantro lime cauliflower rice recipe, we’ll use the stove top method. You’ll add your rice to a skillet with a bit of olive oil and cook for a couple of minutes while stirring. Cover and cook for another 5-10 minutes to get the rice to the texture you prefer. 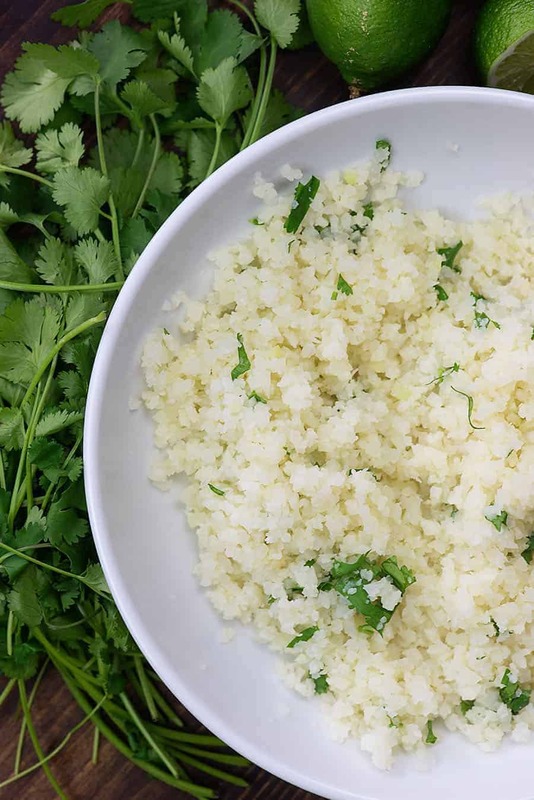 For this recipe, we’ll obviously be seasoning our cauliflower rice with cilantro and lime. When the rice is done cooking, chop up some cilantro to sprinkle on top and then squeeze on some lime juice. I like to season the rice with a little onion powder, garlic powder, and salt as well. You can also make a more traditional Mexican rice by seasoning with cumin, chili powder, paprika, garlic, onion, and salt. 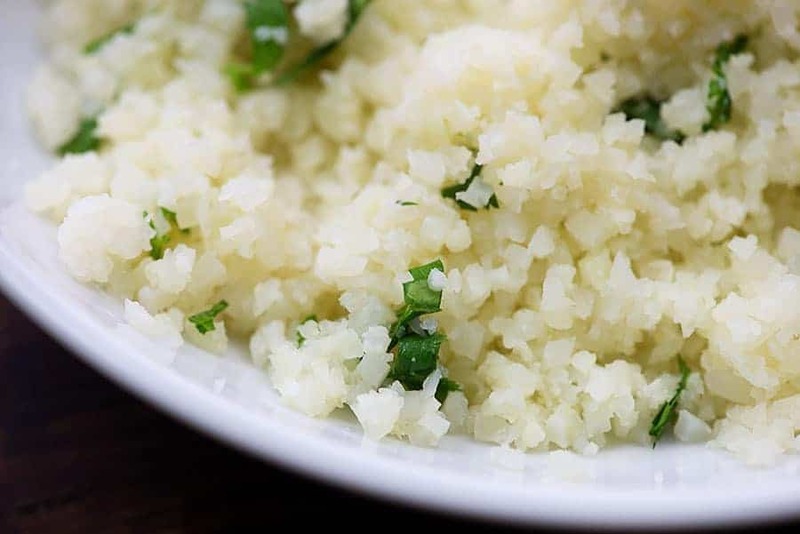 Roasting the cauliflower rice with minced garlic makes for a wonderful garlic rice. Keep it simple, but feel free to experiment! I’ve even made a cauliflower risotto before and shared it on my other blog, if you’d like to give that a whirl. It’s nowhere near as tricky as a traditional risotto, but it comes out so creamy and delicious. Honestly, though, cauliflower rice is a great way to get more veggies in your diet and cut back on those carbs. It’s healthy, flavorful, and, in my opinion, is easier than cooking traditional rice. It takes less time as well. If you’re tired of taco salads, swap out the lettuce for this cilantro lime recipe and it feels like a whole new meal. 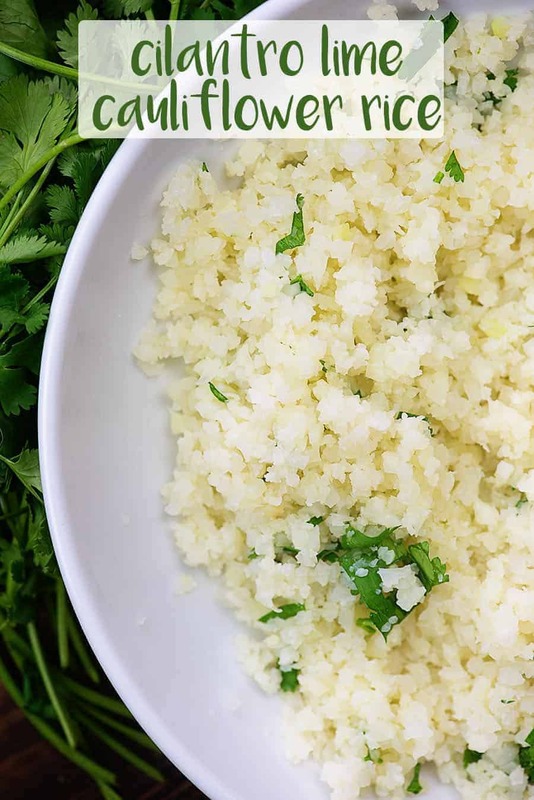 This cilantro lime cauliflower rice recipe is the perfect base to your next burrito bowl. Chop the cauliflower into florets and add to a food processor fitted with the blade attachment. Pulse until you have small rice-sized pieces. Alternately, finely chop the cauliflower into rice-sized pieces with a sharp knife. Heat a large skillet over medium heat and add the olive oil. When the oil is hot, add the cauliflower to the skillet and cook for 3 minutes, stirring often. Cover the skillet with a lid and continue cooking for 5 minutes, stirring occasionally, or until the cauliflower is as soft as you'd like. 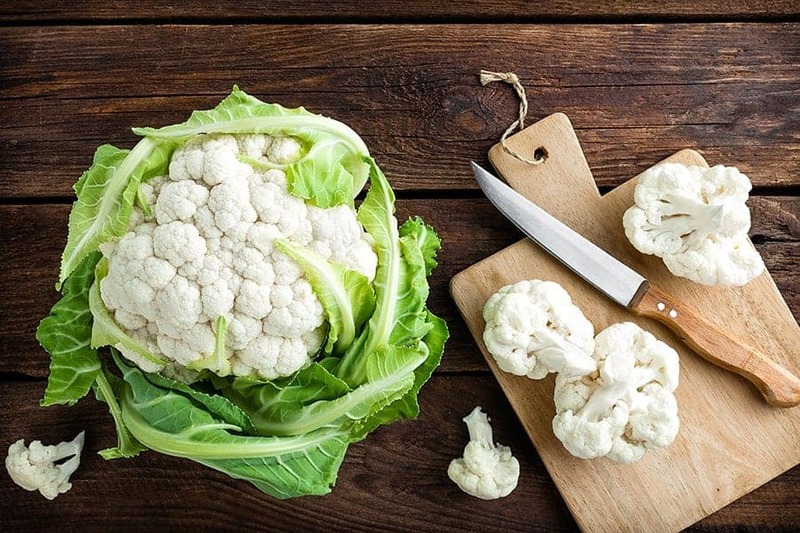 Remove cauliflower from the heat and stir in the cilantro, lime juice, garlic powder, onion powder, salt, and pepper. Pretty awesome recipe. I admit I’m not really a fan of cauliflower but this is definitely a must try. Can we substitute rice for quinoa instead? Could you freeze the cauliflower rice if you don’t need it all immediately? I haven’t tried freezing already cooked cauliflower rice. I’d be a little worried that it would get mushy when reheating, but I can’t say for sure. The box grater works great! (grate?) for making cauli-rice. Is it easier to just start with riced cauliflower or does that change the taste somehow?